Every puppy begins to learn the day they are born. They smell and feel the world around them. They learn from their surroundings, their mum and from us. "If a dog will not come to you after he has looked you in the face, you should go home and examine your conscience. " This is such a noble sentiment I really wish it had more merit. A dog will come to you if he is trained to come from an early age or if he has nothing else on his agenda and you look like fun. What we want is your dog to come to you even when you are interupting his important plan. Puppy training begins with the breeder. It can be no other way because the puppy, like a human baby learns so much in those first days and weeks. At Over The Moon we have slowly begun to evaluate the practises here, incorporate some new training and rearing techniques in order to give each puppy a real head start in life. Like human education, dog training is an ongoing process and is truly life long. Training doesn’t begin with the first puppy class neither does it end with young puppy training. 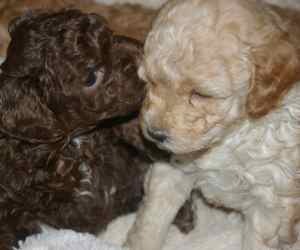 The only thing we know for certain is that it begins the day puppy comes into the world and makes that first little cry. For good or ill it is the breeder that gives puppy his start in life. The first three weeks of life puppy spends upstairs in the nursery. His first lessons are from his mother and from us. He does have some visitors who after removing their shoes and washing their hands can pet the little puppies but mother doesn’t usually encourage strangers to stop by during these early days. When the puppy is small during those first weeks we give him mild stress to stimulate brain function. We use the Super Dog Program developed for the American Military by Dr. Carmen Battaglia. 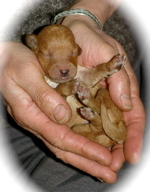 It is now a widely accepted principle that mild stress in the early weeks of a puppy’s life stimulates brain function. Each day we do a series of exercises with each puppy. Puppy mums are often not impressed and so the hardest part of the job is distracting mum while we hold her darling upside down and on his back. Attention Puppies Humans Bring Lunch! During the third week and sometimes at the end of the second puppies have open eyes and they are walking around their pen enough for us to introduce puppy gruel. Feeding time is a bonding time with any baby. When a puppy learns to bond with us he will transfer this skill to his new family. We pat and cuddle and encourage during mealtime. We start by offering a spoon to the puppy first with gruel and then with water. In a few days he learns that often our arrival at the puppy pen means food and scrambles to the dish himself. During the last part of the three weeks we introduce new objects in the puppy pen every day. This is an important to build his puppy confidence. At three weeks the puppy moves downstairs into the relative chaos of the household. For the first time puppy can watch the coming and going of other dogs, children and visitors to the house. The puppy is walking and living in a completely new space. Every day there is a different sort of bed to sleep on, a new toy in the pen, and a new sensation. 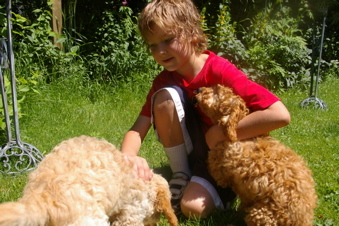 We pick up puppy and cuddle him on his back, ruffle his fur and give him lots of tactile experiences. Often when people think of puppy training their first thought is appropriate bathroom behaviour. At three weeks of age when puppy comes downstairs to be part of the household. They begin in a pen with a large comfy bed for mum and babies to cuddle in. Beside the bed is a small play area with toys. Surrounding the area are trays of litter. It is in this litter the puppies go to the bathroom. It is hard for them to go anywhere else because when their little legs stumble out of bed that is where they land. They quickly learn that the wood stove pellets that we use are absorbent and make a very nice bathroom. As they grow the play area gets larger and the potty area gets further away from their bed. This absorbent material easily translates to ground and grass out of doors. When puppy is between 5 and 6 weeks old, depending on the weather, we take her out after every meal. In the morning it is a good long walk about, weather permitting. We praise her when she pees and poops. Many of them start right away to go off of the path into the bushes to poop. 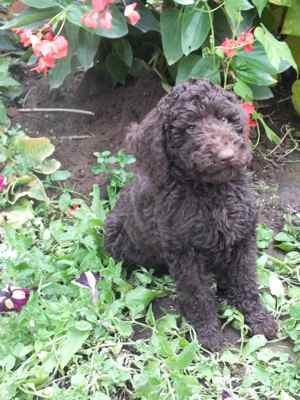 Although at between ten and eleven weeks when puppy goes home he should have a good idea what the great outdoors is for, he is not completely ‘potty trained’. A young puppy has a small bladder and a forming brain. It is usually we people who are trained until he is older and achieves greater bladder control and a clearer understanding of human expectations. Hello Everybody - I'm 3 Weeks Old! After three weeks puppy is ready to meet his public. He will be happy to crawl up on the knee of a child or cuddle in the hand of an adult visitor. We make lattes, give wine, hold parties and anything else we can do to make sure the puppies have a full social life. Our goal is that puppies have met 50 different people before they go home to their families. By six weeks puppy can eat an entire kibble. Every puppy has teeth that grow at a different rate. As soon as he can eat a hard kibble we call him by name and place the kibble where he has to sit in front of us to eat it. He takes the kibble out of our hand. Even if we have to soften kibble we hand feed each puppy an entire meal at least once a day. We place the kibble above his head in just the place he will have to sit †o eat it. It is amazing how quickly puppy will learn to sit in front of a person for a kibble. When puppy jumps up on me for a kibble I am very still and the second he has four paws on the floor the kibble is popped into his mouth. We begin to call puppy by name. This does not create a problem. Names can easily be changed they don’t seem to mind. We call him and he will come because he knows we have a precious kibble. By this time he learns to sit in front to get the kibble. When the puppies are playing in the kitchen we call and they all come running over. It takes a while to learn to wait their turn but they do learn to sit quietly to get their kibble. When the puppies are outside or in the living room we interrupt their game and call them to come. This teaches the puppies to sit in front rather than jumping on people and it begins to teach them recall. We call them as many times a day as possible and give them a kibble. Puppies who have had this experience many times during the first 6 months of life will reward you many times over by coming when they are called. At 8 weeks we begin walking with puppy by our side. We take a kibble in hand, show the puppy and she will trot along under Liz’s hand in order to keep watch on that kibble. We stop and ask her to sit. She will sit and get the kibble. With some puppies, weather permitting we begin with harness and leash. We do the same thing with the harness and leash as she has already learned to do off leash. If she pulls on the harness we stop. If she pulls a lot we go back to having her beside us without a leash and work up to the harness more gradually. If we have not progressed to harness and leash families may do this following the same guidelines. Ouch!! Puppies begin to nip when they discover their teeth. It is hard to wear a dressing gown when the puppies are around because the best fun for them is to grab hold of the hem with and go for a ride. Even though it is fun at first it gets tiresome fairly quickly. Whenever little puppy uses his mouth in an inappropriate way we do just what mummy dog does, we yell ‘ouch’ and stop moving. Some sensitive puppies won’t require you to do this very often. Other happy go lucky pups need a lot of demonstration. When we yell and stop the game we are telling puppy that he hurt us. He doesn’t know that until he hears the response and sees you won’t play any more. Often people move their hands around yelling stop stop which to puppy seems like a good game. When puppy is doing something you don’t want him to do stop the movement. Be a tree. It is time to let your inner drama queen emerge. If puppy bites your hand in play you must scream, howl, show that you are wounded and devastated. Most puppies will eventually notice that you are a pretty delicate creature. Subtlety is not very effective. These are some of the things that are part of our daily routine as part of our Head Start Puppy program. It is why we don’t have many litters but only three or perhaps four each year. We try to give our puppies a good beginning but it is their families who make sure their education begins. At Over The Moon we provide preschool but like children continuing, formal education is important. We ask that all puppy families take their puppies to classes and continue the schooling for as long as possible. A dog’s brain is a to keen to be wasted. A private trainer is lovely but no substitute for a class where puppy must fit in with a group of other puppies and people. There is nothing that we know of value that we didn’t learn from Dr. Ian Dunbar. 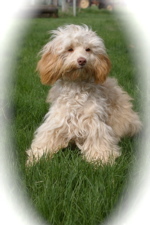 We believe that his approach to dog training is the right approach for the Australian Labradoodle.